The votes have been cast and counted. We had a large number of votes this year probably due to our Championship winning season making it easy to think of players that did well. Voting took place in July, thanks to all our members that voted. 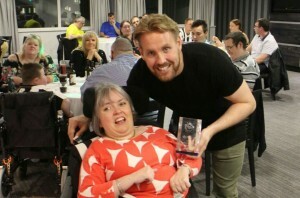 Rob Elliot pictured above won last year’s award. We now have a date agreed with NUFC for the winning player to collect the award at the Player of the Year night, which will be held on Wednesday 20th September at St. James’ Park. Doors open at 6.30pm, the player will arrive about 7pm and pie, pea & chips supper will be served around 8pm. The will be a quiz, bingo, raffle and disco on the night. If you want to come to this event please purchase tickets by the 13th September, ticket prices are below. You will be billed for all tickets purchased even if you don’t attend. Tickets are sold on first come basis, cheques or postal orders should be made to NUDSA, if you’d like to pay by bank transfer then email info@nudsa.org – to order tickets by phone it’s 01670 717739. See prices below, don’t miss this great event!